NEW YORK (CNNMoney) -- General Electric logged higher fourth-quarter earnings and revenue Friday that beat Wall Street's expectations, getting a boost from its finance arm and strong growth in equipment orders. The Fairfield, Conn.-based conglomerate said its fourth-quarter earnings from continuing operations rose 31% to $3.9 billion. Earnings per share rose to 36 cents per share, up 33% from a year earlier. Analysts polled by Thomson Reuters had forecast a profit of 32 cents per share for the quarter. Net income, including discontinued operations, was $4.5 billion, up 51% from a year earlier. The industrial giant said its year-over-year revenue rose 1% to $41.4 billion -- the first positive growth in nine quarters. Analysts expected the company to report a 4% drop in revenue to $39.9 billion. Shares of GE (GE, Fortune 500) gained more than 5% on the news. "GE ended 2010 with three consecutive quarters of strong earnings growth," Chairman and CEO Jeff Immelt said in a prepared statement, highlighting gains in the industrial segment, as well as strength in orders and improvement at GE Capital. While the company didn't offer concrete guidance for the year, Immelt said on a call with investors that earnings should be up "nicely," and that its fourth-quarter report "was a good precursor for what we'll see in 2011." 'Team effort': Fourth-quarter orders were up across the board. Overall industrial orders jumped 12% year-over-year, with a 20% surge in equipment orders and a 5% increase in service orders. Orders in energy infrastructure grew 4%. Meanwhile, the company's backlog increased by $3.1 billion to a record $175 billion. "They have been posting solid order growth for a while now, so it's not difficult to see the company continuing to grow because of this," said Daniel Holland, an equity analyst at Morningstar. The health care sector was another bright spot, with revenue rising 8% and profit jumping 10% in the quarter. GE manufactures products ranging from jet engines and health care technologies to light bulbs and electric cars, so the company is widely viewed as a barometer of the overall health of the economy. "It was a team effort in terms of the overall story," said Holland. "It seems like the individual businesses are starting to make their way through the recession and are starting to turn around." Performance at the company's energy infrastructure division was also encouraging. While revenue and profit slipped slightly in the quarter, the pace of declines slowed, said Holland. "You always want to see growth particularly out of its power generation segment," he said. "That segment is driven by electricity demand across the world, and electricity demand is linked to economic growth and activity -- so we want to see the wheels of the economy continuing to improve." GE Capital, the company's finance division that was hard-hit during the financial crisis, continued to bounce back in the fourth quarter. Net income in the unit rose to $1.1 billion from $100 million a year earlier. "GE Capital is doing better than I think anyone would have expected a couple quarters ago, let alone two years ago when we were in the depths of the recession," said Holland. "Even in its weakest spot -- commercial real estate -- you're seeing losses lessen." New developments: The company expects to complete the sale of its controlling stake in NBC Universal to Comcast Corp. (CMCSA, Fortune 500) this month, after getting U.S. regulatory approval earlier this week. The deal was originally expected to close in the fourth quarter of 2010, but was delayed to the first quarter of 2011. That resulted in a lower-than-expected tax rate in the fourth quarter and will lead to a higher tax rate in the first quarter, said Immelt. As it looked to sell NBC, the conglomerate also made several acquisitions in the fourth quarter. GE Healthcare picked up Clarient, GE Oil & Gas announced it will buy Wellstream Holding Plc. and GE Energy said it will acquire energy provider Dresser, Inc.
On Tuesday GE also announced five new partnerships with Chinese companies, totaling more than $2 billion in revenue. "This seems like a trail marker that they're heading in a certain direction," said Holland. "It definitely helps to get access to a market that is otherwise pretty difficult to get into. Having a deal with all these big companies gets their technology in the door and gets GE better access to more customers." 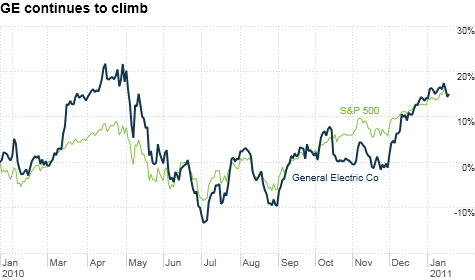 In December, GE announced its second dividend hike in six months, boosting it 40% from the beginning of 2010. Early Friday, the White House announced that President Obama will name Immelt as chairman of the new President's Council on Jobs and Competitiveness. The appointment is seen as part of the administration's effort to patch its previously shaky relationship with big business and demonstrate its focus on the nation's employment picture. "You all know my commitment to GE, and that doesn't change," Immelt said to investors on the company's post-earnings call Friday. "At the same time, I'm honored to be able to work on something with this broader context." Hate the banks if you want. But we need them.